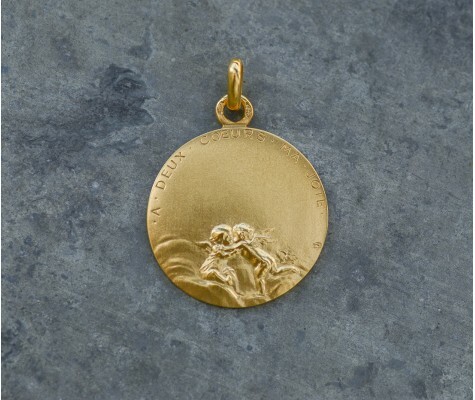 Our medals and chains are certified 18 carat gold, stamped on the ring or medal with the eagle's head hallmark. Our diamond hallmark includes the initials SC, a star and a moon. This certifies all our medals are manufactured by Canale. Our bronze artistic medals are made from brass with a patina finish, featuring our hallmark and the 'bronze' stamp. Our loyal customers have spanned several generations. You will be served in-store by the actual craftsmen who produce and engrave our medals. We offer the best value for money in terms of weight for 18 carat gold medals. Our gold medals are struck using steel tools known as 'matrices' that enable very intricate details to be reproduced. The satin finish makes the design on the medal stand out better than a polished or matt finish. Be aware that more and more manufacturers are using casting rather than striking. 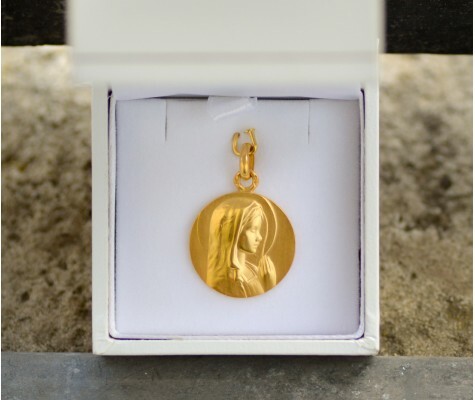 The advantage of casting is that it creates a lighter gold weight, making it cheaper than a struck medal, but also meaning that the level of detail will be less intricate. Polishing or adding a matt sanded finish is used to hide defects due to casting. Traditional medal engraving is dying out as the art has been taken over by machine engraving. I often have customers who ask me for free engraving because other competitors provide this service free of charge. I reply that our company champions personalised, hand-made craftsmanship for many reasons, not least the aesthetic aspect..
You come to us for our expertise, as the art of engraving has existed for centuries. And yet we are currently the only medal manufacturer and engraver on the Île de la Cité in Paris..
Machine engraving offers a standard, impersonal level of engraving which may suffice, depending on what you are looking for and your budget. If engraving is provided free of charge by a competitor, the chances are that it will be done by machine, or perhaps done by machine and completed by hand. But you can be sure that free engraving can never be carried out with the utmost care, as this would not be cost-effective. Our customers never regret setting aside an average budget of between 35 and 45 euros for engraving. The positioning and spacing between each letter is gauged by eye rather than by an automated process. Aesthetics and balance take priority.